On behalf of Global Hawaii Blog I would like wish everybody a Happy and safe Halloween. May your baskets overflow with candy and joy. A timely entry today is a picture I took at the Architects Hawaii pumpkin carving contest at American Savings Bank Building. 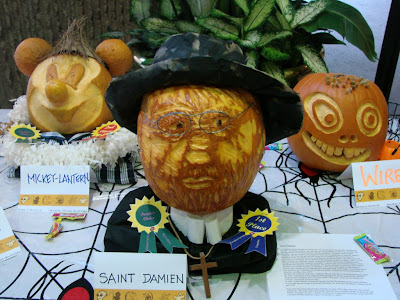 This features Mickey-Lantern, Wired and the very timely Saint Damien pumpkin. Thanks to “Furlough Fridays” Halloween comes early at Pearlridge Elementary school as they celebrated Thursday nite with their pumpkin carving nite. 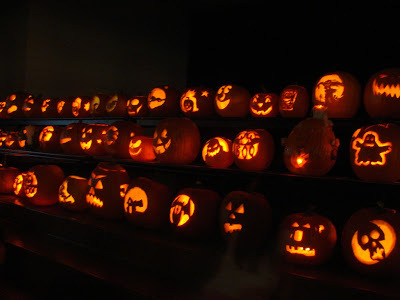 Each year the kids and their parent carve up a pumpkin and at the end of the nite they light them all with candles for a beautiful display. I left the aperture open on a tripod to show off the glow of the candle. You can compare it to last years picture. We continue our Halloween week with the infamous Morgan’s Corner tree I snapped it on one of the Oahu Ghost Tours walk. 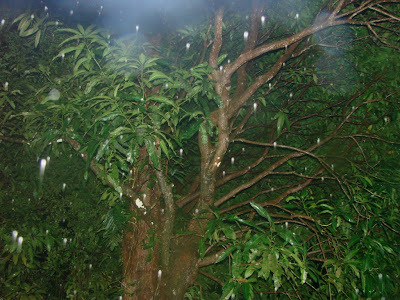 It is an unedited picture though it was raining and I did use a flash you can make your own judgment on if these are ghostly orbs. If you grew up in Hawaii you’ve heard the Morgan’s Corner legend where a couple parks under the tree and the car would not start and the boy goes for help and the girl waits a long night hearing the branches of the tree scrapping the on the car to awake to police and the boyfriend hanging dead from the tree with his arms scraping the car. What we do know about Morgan’s Corner is in 1948 a Mrs. Terese Wilder who lived across the street from Dr. James Moran was murdered by two thieves later convicted. The place is names after Morgan who owned a large property. It is said the tree is haunted by this murder and perhaps the “legend”. It’s almost a rite of passage for many teens to go at night run up and hug the tree. If you hug the tree and look up you’re supposed to see the ghostly image of the boy hanging upside down. If you like spooky Hawaii ghost stories be sure to check out our selection of ghost stories provided by Amazon.